For over 60 years every Sennheiser mic or headphone has come with a built-in mission: to stay true to the sound and soul the music was given by its artist. From the fragile intimacy of a whispered word to the deep dark punch of an attacking bassline. Sennheiser delivers pure emotion and excitement. A quality that has convinced a broad spectrum of artists – from Franz Ferdinand to the White Stripes to the Sugababes, and of course music lovers all over the world. This is the 2nd project Sennheiser has hired us to do. 2 years ago, we designed their myspace page. This Facebook Iframe App is one of our most advanced pages yet. While we designed the whole page, we worked with another firm to code the custom poll section. This section actually has its own backend system, so the client can login and change out the poll question every week. If you are interested in having your own custom polls inside your site and/or facebook page, please contact us for more details. 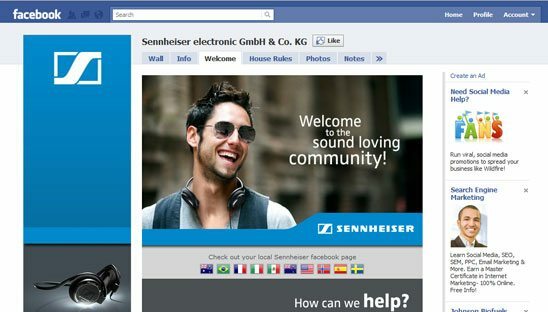 If you click on one of the flags, it will take you to that Countries FB page of Sennheiser.